Ballymac u6 players with Kerry Minor Captain Paul O’Shea at the Ballymac Medal Presentation. Our U6 training for 2018 ended on Sunday morning last in a most enjoyable day for players, coaches and parents. Kilcummin U6 players came to visit us and we had four teams playing in two challenge games. It was a great morning with all the players showing off the skills they learned all year and most importantly playing with all the new friends they made since last April. It was a morning of fun and laughter and we sincerely thank Kilcummin for coming to Ballymac GAA grounds to play with us. 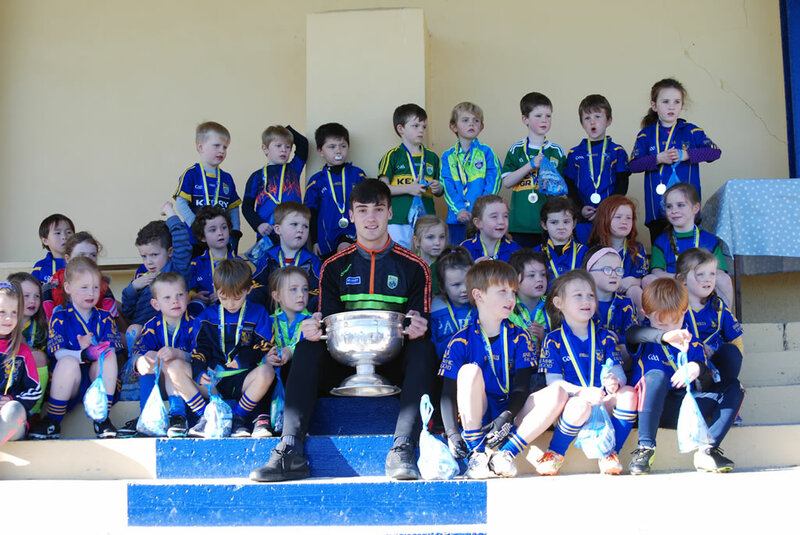 The highlight of the day was when The Kerry Minor Captain Paul O’Shea presented all the players with their end of year medals and took photos with the children and the Tommy Markham Cup. We wish to thank our Head Coach John Leen and his coaches Sheilann O’Rahilly, Kevin Leen, Bridget Leen and TJ Casey for giving of their time every Sunday morning and Co-ordinator Maureen O’Shea for all the communication all year. Thank you to all our young players who turned up every Sunday morning and brightened up our Sundays and lastly a big thank you to all the parents and grandparents who brought all the children to training every Sunday. It was a wonderful team effort all year. Míle Buíochas. Our u10 boys had a busy weekend as on Saturday last the older boys took part in the inaugural St Francis Special School Beaufort Blitz held in the Kerry GAA Centre of Excellence in Currans. Here they acquitted themselves very well winning both of their games against Keel and Kenmare however they were unable to complete their group games as the event had to be abandoned due to the adverse weather conditions. Then on Sunday we welcomed Kilcummin for a challenge game as part of the last day of academy where we had a good work out with our visitors. Afterwards Kerry Minor Captain Paul O Shea presented medals to all our players in recognition of the effort they put in during the year. Many thanks to Paul and his father Tom for coming to do the presentations. While it was the last day of academy we have one more Blitz left to play the John Lynch Memorial Tournament which is being organised by Austin Stacks on Saturday October 27th. Ballymac GAA would like to acknowledge the success of The Ballymac Ladies Luncheon and Fashion Show that took place in the Rose Hotel on Sunday October 7th and to thank everyone who supported the event. We would also like to congratulate the Organizing Committee of James Godley, Teresa Higgins Walker, Nora Curran, Mary Godley, Anne Savage and Veronica O’Donnell on a job well done. The Ballymac GAA Club wishes to thank everyone who helped us and supported us in our recent recycling drive. We were delighted with the response we got from everyone in the club and The Parish. Our sincere thanks to you all. Ballymacelligott GAA Club wishes to extend its sympathy to the Baily family Rathanny on the death of Paddy Joe during the week. Paddy Joe was a former stalwart player with the club. May He Rest in Peace.